This is the second in a series of posts by Phillips Educator Rachel Goldberg about this year’s attendance record-breaking annual free family festival. Read the first installment here. 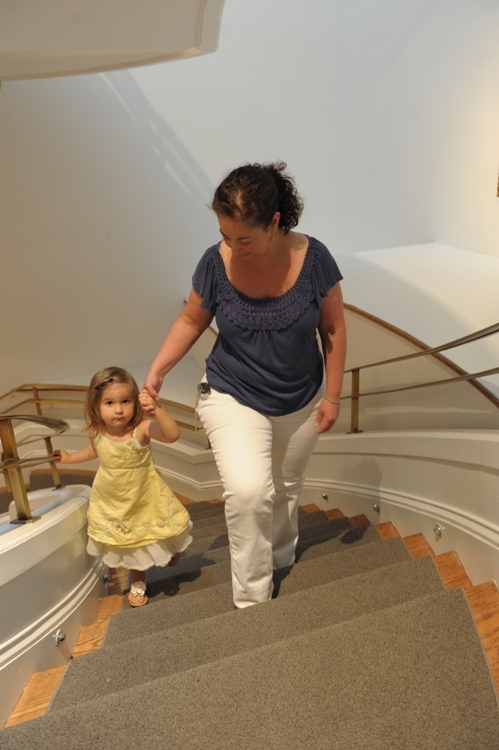 On Saturday, June 2, the first day of Jazz ‘n Families Fun Days, my two and half-year old friend (niece-by-choice) Sophia came to participate in the fun at the museum. All of a sudden and completely out of nowhere about six months ago, Sophia became fascinated with ballet. Her parents first course of action was to enroll her in classes. My first course of action was to take her to the National Gallery of Art to visit the Degas sculptures of the Little Dancer. Sophia wore her pink tutu and ballet shoes for the occasion and danced around the sculptures. She has since become obsessed (seriously, she reads it at least three times a day) with this book, so I wasn’t at all surprised when I asked her what she wanted to do at the museum and she replied, “I want to see the Degas.” Two Degas paintings are currently hanging on the second floor of the Goh Annex, and Sophia dragged me up the stairs and oooohhed and ahhhed at both of them. She even asked me to pick her up (quite unusual for this very independent child) so she could see them more closely. This entry was posted in Experiment Station and tagged Edgar Degas, Jazz 'n Families Fun Days, kids. Bookmark the permalink.